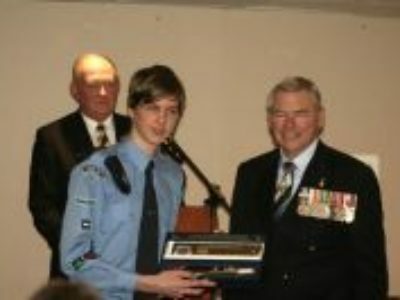 Leading Cadet Liam Howes has been awarded the Hornsby RSL Sub Branch ‘Air League Sword of Honour’ as the most outstanding cadet of the year for service to the RSL and the squadron in 2013. Liam (16) who attends Arden Anglican School at Epping, is a member of the Hornsby RSL Squadron, Ulm Wing. Liam was presented with his award by the National President of the RSL, Rear Admiral (RADM) Ken Doolan AO at a meeting of the HRSLSB held at HRSL Club Ltd on Sun 27 July 2014. Some 120 members and guests attended the event which was followed by a luncheon with the Admiral as guest speaker. “I am very proud of all my children and thank the Youth Club for providing these opportunities for them,” said proud mum Mari.